How to Fix SSH Host key verification failed on Linux, Troubleshoot Host key verification failed, solve Host key verification failed, troubleshooting ssh issue on linux, linux solution, solution to fix errors host key verification failed. Are you getting Host key verification failed errors when you trying to connect the server using ssh connection as shown below. No need to panic about this errors, its a warning of hostname mismatching in the existing hostname in the known_hosts file. Just look at the last three line from the output which will give you the clear explaination. ECDSA host key for linux1 has changed and you have requested strict checking. Here is a solution to solve the errors. 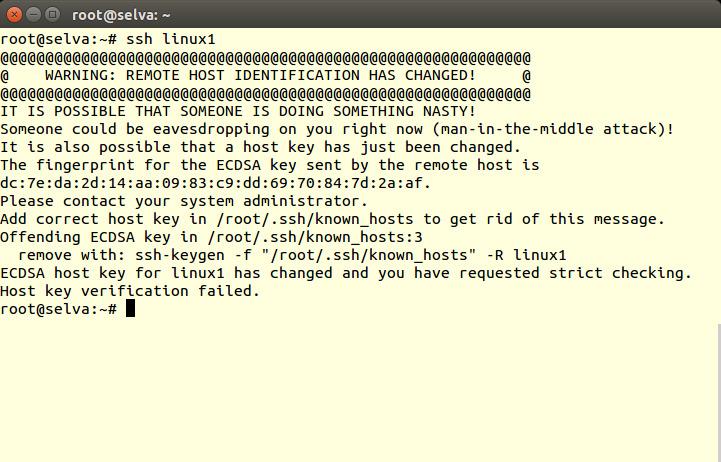 Solution 1 : Just copy the command "ssh-keygen -f "/root/.ssh/known_hosts" -R linux1" as shows in the error and execute it. Solution 2 : Open the /root/.ssh/known_hosts, search the hostname "linux1" as shows in the error and delete the lines.